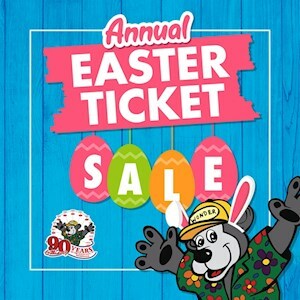 Annual Easter Ticket Sale 50% OFF Ticket Sale (Online Only) 40 Tickets for $20 (Valued at $40). Spring has sprung, Gillian’s Wonderland Pier Ride Tickets. Gillian’s Wonderland Pier offers over 34 Rides and Attractions for all ages! Be a part of Gillian's 90th Season on the Ocean City Boardwalk! Each transaction purchase may include multiple ticket purchases but will only generate one bar code. Your printable voucher can be redeemed at any Ticket Office or Guest Services. You may choose to pick up or have it shipped. Gillian’s Wonderland Pier Gift Card works like cash and are accepted throughout the Gillian’s Wonderland Pier. Gillian’s Gift Cards are a fun and affordable way to enjoy all that Gillian’s Wonderland Pier has to offer from ride passes, food & beverage and souvenir’s. Best of all you can reload you Gift Cards anywhere at Wonderland Pier for continued use. Gillian’s Gift Cards are the perfect gift for holidays, birthdays, or simple an easier way to go cashless. If you have any questions, please call us at 609-399-7082. Amusements with the family in mind since 1929!